Son of Candy Ride earned his fifth straight grade 1 victory. Midway on the final turn of the world’s richest race Jan. 27 at Gulfstream Park, jockey Javier Castellano made his move. 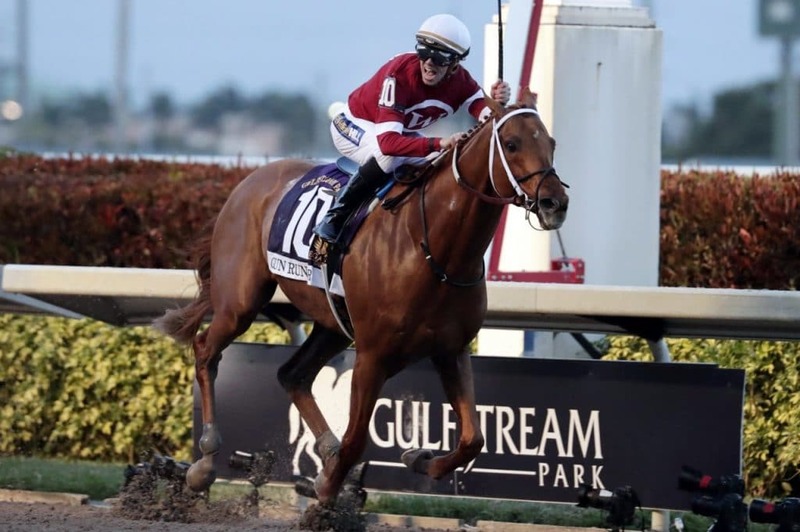 He brought West Coast off the rail, moved outside of frontrunning favorite Gun Runner , and began to cut into the lead with strides that added even more electricity to the $16.3 million Pegasus World Cup Invitational Stakes (G1). “I attacked (Gun Runner) to try and surprise him,” Castellano said. Watching his horse challenge for the lead gave Hall of Fame trainer Bob Baffert a thought that maybe he could duplicate his 2017 feat of winning the inaugural Pegasus with Arrogate last year. “I thought we had a chance to get there and it looked like we were giving (Gun Runner) a run,” Baffert said. And then, in the next moment, all of the greatness that carried Gun Runner to 2017 Horse of the Year honors and an enviable streak of grade 1 wins came to the fore. Jockey Florent Geroux let out a notch and Gun Runner responded like a champion to fend off the bid of another champion. In the final race of a spectacular career, Gun Runner held Gary and Mary West’s newly crowned 3-year-old champion at bay through the stretch and recorded a 2 1/2-length victory over West Coast in the second edition of the Pegasus before a crowd listed as 16,400. In his swan song Winchell Thoroughbreds and Three Chimneys Farm’s Gun Runner lived up to every bit of the expectations that made him a heavy 6-5 favorite ($4.20) over his 11 rivals. With the $7 million winner’s share of the purse, Gun Runner moved past California Chrome into second on the all-time earnings list with $15,988,500. He trails only Arrogate, who beat him in last year’s Dubai World Cup Sponsored By Emirates Airline (G1) and retired with $17,422,600 in earnings. That Dubai World Cup was also Gun Runner’s last loss. He will now head to Three Chimneys for a life at stud off five straight wins, all in grade 1 stakes—the Stephen Foster Handicap, Whitney Stakes, Woodward Stakes Presented by NYRA Bets, and Breeders’ Cup Classic. As easy as it was at the end, there was some trepidation as the horses loaded into the gate. Gun Runner had post 10, a notoriously tough spot for winning at 1 1/8 miles on the main track at Gulfstream. “The stress left me when he broke nicely out of the gate and slid over to the two-path. I felt very comfortable after that,” Winchell said. Collected tracked Gun Runner’s pace in the Breeders’ Cup, but when they swapped roles in the Pegasus, it did little to help Collected. After carving out early fractions of :23.41 and :46.61, with Gun Runner hounding him, Collected began to weaken at the three-eighths pole and faded to finish seventh. That left Gun Runner on the lead, and the only horse doing any running behind him was West Coast. Third in the Breeders’ Cup Classic, the Travers Stakes Presented by NYRA Bets (G1) and Pennsylvania Derby (G1) winner launched a spirited challenge from fourth as he and Gun Runner separated themselves from the field. Yet, after West Coast moved to within a length of Gun Runner at the eighth pole in a two-horse duel to the wire, Gun Runner edged clear to post a hard-fought victory for his 12th win in a 19-race career. Gun Runner, bred by Besilu Stables, covered the nine furlongs in 1:47.41. West Coast, the 7-2 second-choice, collected $1.6 million for a runner-up finish in which he was a decisive 10 3/4 lengths ahead of the next horse under the wire. Well behind the top two, 13-1 shot Gunnevera grabbed third by a half-length over 74-1 outsider Fear the Cowboy. They received $1.3 million and $1 million, respectively, in purse money in a race where entrants paid $1 million for a spot in the race but were guaranteed a return of at least $650,000. The order of finish was completed by Seeking the Soul, Stellar Wind, Collected, Sharp Azteca, Giant Expectations, War Story, Singing Bullet, and Toast of New York, who made just his second start since a runner-up finish in the 2014 Breeders’ Cup Classic. In other news Summer House was 2nd in the $125,000 American Beauty Stakes at Oaklawn.